The problem is, as commonly the case with economic statistics, there is a number to suit any point of view, and the choice of metrics matters. GDP comparatives 1: in current prices terms, expressed in billions of U.S. dollars, China's GDP in 2017 was USD12.015 trillion, against the EU's USD 17.309 trillion. 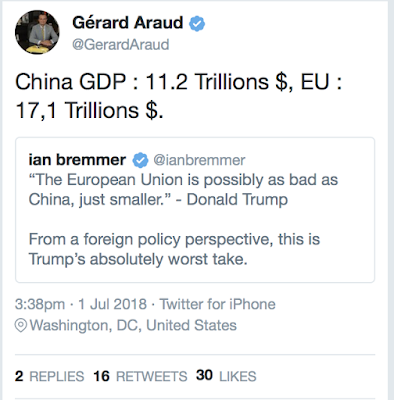 The EU was 'bigger' if not 'badder' than China. The U.S, was 'bigger' than both at USD 19.391 trillion. GDP comparatives 2: in Purchasing Power adjusted terms (expressed as International dollars to take account of exchange rates differentials and price differences), China GDP was IUSD23.159 trillion against smaller EU GDP of IUSD 20.983 trillion and even lower U.S. GDP of IUSD19.391 trillion. Since PPP adjustment, imperfectly, accounts for the simple fact than people in China and the EU do not live in a dollar-priced world, although some of their imports do reflect dollar-priced goods and services, this is one of the salient measures for comparing three economies. And by this measure, Mr. Trump is correct: the EU is 'smaller' than China, although the U.S. is smaller than both. Trade measures: EU ranks second in the world in terms of exports and imports of merchandise trade (excluding intra-EU trade), and it ranks first in the world in terms of exports and imports of services; with total extra-EU trade accounting for 16.8 percent of EU GDP. Merchandise exports amounted to USD 1.932 trillion in 2016, with merchandise imports of USD 1.889 trillion, services exports of USD917 billion against services imports of USD771.8 billion. China ranked first in the world in merchandise exports and second in the world in merchandise imports, fifth in commercial services exports and second in services imports. China's trade with the rest of the world amounted to 20 percent of its GDP, with merchandise exports and imports of USD2.098 trillion and USD1.587 trillion, respectively, and services exports and imports of USD207.3 billion and USD449.8 billion respectively. So total EU trade volumes were USD 5.51 trillion in 2016 against China's USD 4.342 trillion. 'Large' Europe, 'small' China. The U.S. total trade volumes with the rest of the world were between the two at USD4.921 trillion, making the U.S. smaller than the EU. One possible measure of a nation's 'badness' in trade is the number of official disputes involving that nation as a complainant or the respondent in the WTO. Per WTO 2018 Annual Report, over 1995-2017 period, the U.S. were involved in 115 disputes as a complainant and 134 disputes as a respondent. 'Badsky' China numbers were 15 and 39 respectively - both, fractions of the U.S. Aggregating the EU member states' numbers, EU was involved in 107 and 122 disputes, respectively, although omitting states' disputes before they joined as the EU members reduces these numbers to 98 and 111. Which means the EU is 'worse' than China, but 'better' than the U.S. when it comes to following rules-based trade. The comparative, of course, is distorted by shorter duration of China membership. Adjusting for that, China figures rise to around 50 disputes filed and 160-170 disputes responded, making things even more complicated in terms of 'badness'. Another possible measure is the current account surplus each country / block runs against its trading partners. IMF delivers some stats. The U.S. is the 'Goldilocks goodie' in that department, using dollar reserve currency status to run massive deficits at USD 466.25 billion in 2017 (similar to 2016 USD451.7 billion deficit, but vastly smaller than the IMF-projected CA deficit of USD614.7 billion for 2018 - all praise Mr. Trump's profligacy). China is clearly a 'baddy' in these terms, with a current account surplus of USD 164.9 billion in 2017, down on USD202.2 billion in 2016. The EU, however, is in the league of its own 'awfulness', with current account surplus of USD417.24 billion in 2017 up on surplus of USD332.5 billion in 2016. 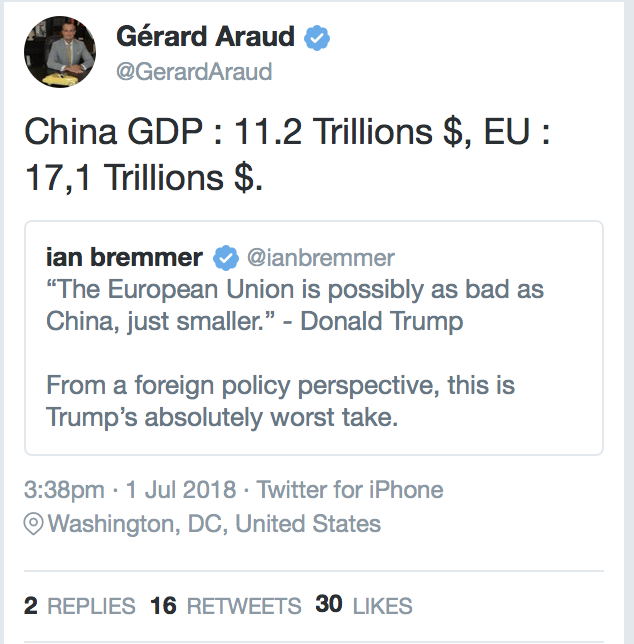 So the EU is 'badder' than the already 'bad' China in these terms. Third measure of 'badness' as it relates to trade is the physical support for WTO by each country/block, which can be measured by the annual share of each in total WTO budget. Again, per WTO report cited above: the EU share of total WTO budget is 33.6 percent, against the U.S. 11.38 percent and China 9.84 percent. While China's budget contribution should be lower due to the country having s bizarre, 'non-market economy' status in WTO standing, U.S. contribution is small relative to the country's share of global GDP, while EU's share is disproportionately large. Who's the 'baddest' in these terms? Fourth measure of 'badness' can be trade-weighted average tariff imposed by the country. WTO latest data on this covers 2015. The EU run 3.0% trade-wighted average tariff across all of its trade, with average agricultural tariff of 7.8% and average non-agricultural tariff of 2.6% with 100% binding coverage. China average trade-weighted tariff was 4.4% (agricultural 9.7% and non-agricultural 4 percent) with 100% binding coverage. Which makes China 'badder' than the EU. U.S. comparable figures were 2.4%, 3.8%, and 2.3% for average trade weighted tariffs, and 99 percent binding coverage. In summary, the EU is marginally 'worse' than the U.S. and vastly 'better' than China when it comes to tariffs protection. In bilateral trade protection terms, 58.3 percent of non-agricultural imports from the U.S. were duty-free in the EU, against 19.6 percent of EU imports from China. China imported 56.5 percent of its imports from the U.S. duty-free, and 46.5 percent of imports from the EU were also zero-duty. U.S. imports from the EU were 64.9 percent duty-free and its imports from China were 35.5 percent duty free. When it comes to U.S. exports, the EU was a better destination, in these terms, than China. 'Better' EU than China in these terms. We can draw many more comparatives in trying to gauge what 'worse' and 'smaller' might mean in the case of China vs EU comparatives when it comes to possible White House-targeting criteria. In reality, economics, trade, trade policies and finance are complex. Far more complex than Spaghetti Western. 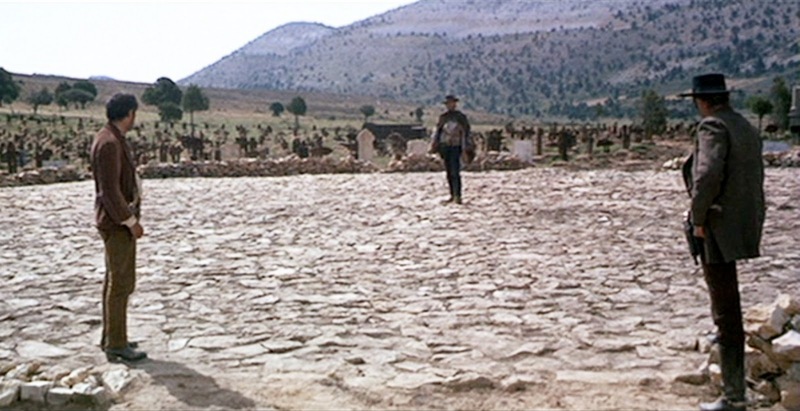 Yet, even 'The Good, The Bad, and The Ugly' had serious shades of grey when it came to delineating the three villains Mexican standoff at the Arch Stanton's grave. 5/7/18: Does the WTO treat the U.S. "very badly"?